So I've been thinking a lot about automation with my kitchen plants. I don't like having to remember if they need water all the time. While this burden has been reduced with my Electric Soil Finger I would still prefer if everything took care of itself. Enter automatic watering! There's already a lot of different solutions for automatic plant watering, but I all found them lacking in one aspec: You need to use a pump with special diameter tubing. I would prefer not using a pump as that would require less power, be a lot more silent - a big pluss in a tiny dorm, and I won't have to buy several meters of tubing that fits the pump. I solved both of these problems and actually won a prize for doing so! Instead of using a pump I had a servo react to sensor readings regarding soil moisture. The servo then opens or crimps shut a water tube to either let water flow or turn off the stream. Another improvement, I didn't have to buy a water tube. This system works with most tiny water tubes no special size. So I made my own water tubing by using the isolation of a power cord. These improvements made this instructable my most popular yet with currently over 60.000 views! I also won a prize pack in the Low Water Challenge. Click here to read my full write up! 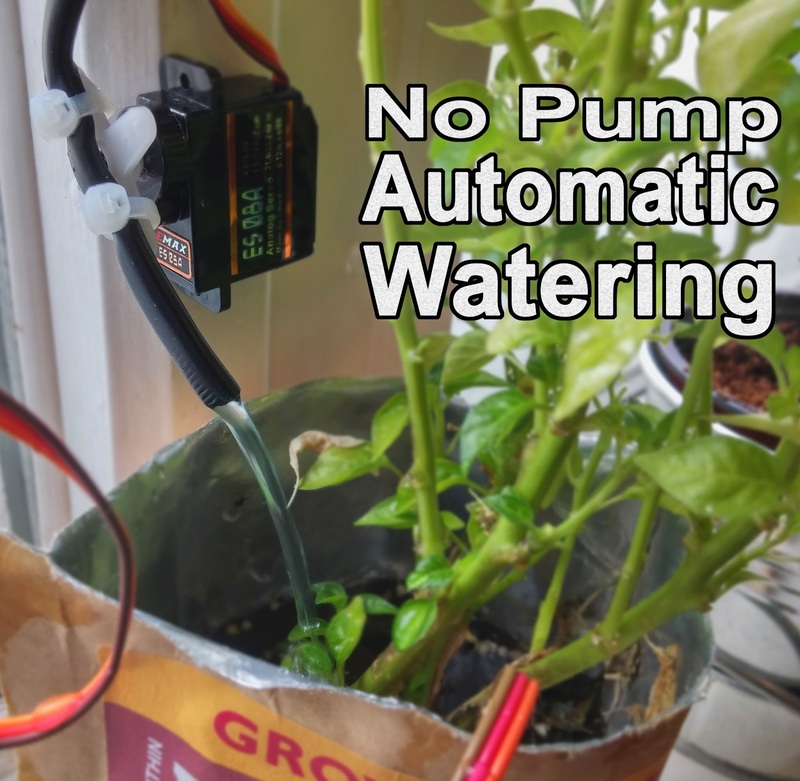 In this instructable I'm going to show you how you can make your very own automatic plant watering system. The best part? This solution requires no pump! The benefit of using an automatic watering system is that you avoid having your plants start to dry out, and you also wont accidentally soak your plants. The moisture is kept at the perfect level for your plants and you end up using less water! There's a lot of different automatic watering systems out there. These seem to work great however there has always been something preventing me from building them. They all require a pump. Personally I would prefer not to use a pump because I think they are expensive and makes a lot of noise. I went to the drawing board to see if I could come up with something different! This system uses a micro controller and soil sensor to monitor the water level of your plants. If your soil is starting to dry out the controller will counter this by watering the soil until it is sufficiently moist again. Instead of using a costly and noisy water pump, we are going to use a servo to elegantly open and crimp a water tube. So cheap. So easy. I've been featured in an article! Gareth Branwyn from Make Magazine has written an article about this project. At the time of writing it's on the front page of makezine.com or you can click here to read it.